Thalasso Bali's "Qualitialized (Quality & Realize) Thalassotherapy Center will anticipate your beauty and wellness needs"
Long limbs and vital statistics are minor contributors to your beauty. Much more important is the state of mind that sits hands of dedicated Thalasso therapist. Take the time for yourself and maintain your health and beautiful body. 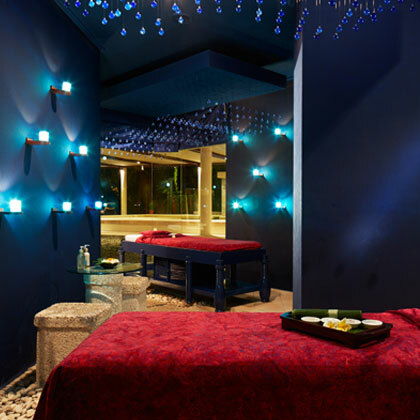 Thalasso Seawater and traditional Balinese treatments outstrip those from other spas in Bali. The Thalasso Bali is more than just a Spa. Standard and tailor – made programs are available from many kinds of Thalasso therapy treatments plus optional Asian traditional treatments. 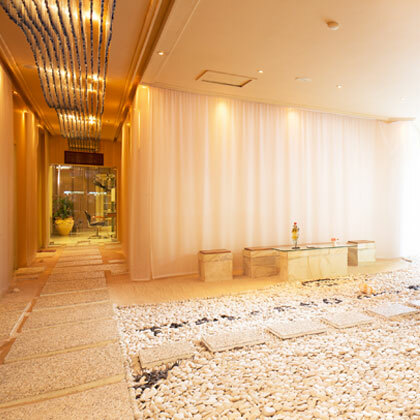 All treatments rooms are private and individual air-conditioned. Each room has a different theme and atmospheric lighting effects to indulge your senses. Also couples treatment room available. All therapists are French trained Hydro therapist and masseur. The Thalasso Bali operates daily from 09:00 am until 09:00 pm (extended hours can be arranged but must be booked in advance and must include a minimum of 10 pax). Advance reservation is recommended as appointments are subject to availability. Please call ext. 8513 to make your appointment or come direct to the Thalasso Bali. For group reservation, Please contact the Thalasso Bali Sales Department directly regarding group reservation and menu. All published rates are subject to 21% tax and service charge. The rate is subject to change without notice. Wide range of amenities and toiletries are provided in the changing rooms and locker areas. For your treatments we ask that you disrobe completely within the privacy of your treatment room. Disposable Thalasso – wear, robe, bag and slipper are available for you in your respective locker. Please bring your own swimwear for use in the Aquamedic Pool. In order to receive the most relaxing treatments we respectfully request that all mobile phones, pagers, electronic devices and other valuables are left in your room safe. We thank you for this cooperation. Thalasso Bali is open to Visitors and Hotels Guest. Guests are advised to arrive at the Thalasso Bali reception at least 20 minutes prior to treatment to allow sufficient time for counseling. Late arrival will be subject to reduced treatment time. Thalasso Bali accepts cash and major credit cards. Mirage Guests may charge Thalasso services and products to their room. 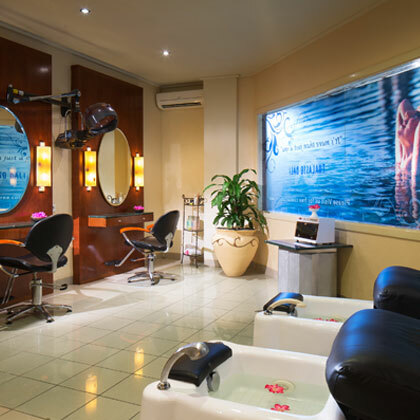 Selected treatments are reserved especially for you with one of our professional French trained therapists. At least 24 hours notice is required for cancellations. For cancellation made less than 24 hours prior to your scheduled appointment, a 50% cancellation fee will be applied. Full charge will be automatically imposed for no show and same day cancellations, charged directly to your room account or to booking agent. Group cancellation policy is advised when the reservation is made. We request that no jewelry be worn during your visit to the Thalasso Center. The Management of Thalasso Bali accepts no responsibility for the safety or money and valuables of any kind brought on to the premises. No smoking within the Thalasso Bali Center area. Any alcohol consumption is not advised before any of the Thalasso treatments. To make the most of your treatment time, the Mirage Kid's Club offers a professional child care service located near the Thalasso Bali Center, which is open daily until 05:00 pm. Additionally, there is also a baby sitter service available especially for babies and toddlers. Reservations should be made at least 24 hours in advance. If you are pregnant, you may want to avoid treatments using deep pressure. Please inform our Thalasso Reception of your condition upon requesting the treatments, enabling us to assist you in selecting the treatments most appropriate. Ladies in their cycle are kindly requested not to use the Aquamedic Pool, you may defer it to another day. Please be informed that cream Bath treatment cannot be performed for hair extension users. Please be informed that menus including manicure and pedicure treatment cannot be performed for extension nail users. Welcome drink will be served upon check in the Thalasso Bali, and also spa meal and drink will be served based on your total consumption. Free transportation is available based on location and total consumption. Please contact to Thalasso Bali Reception regarding the policy.